The Wilderness is a very dangerous place in RuneScape, where people are looking to kill other players. Many people have gained and lost millions here, and its not a spot to be taken for granted. Freeplay PKers don't have the special attacks to 1-hit you, or the spells to TeleBlock and to freeze you like an ice cube, but the majority of them have greater PKing skills. They have the tactics and the knowledge to turn you into minced meat. So never underestimate your opponent here. 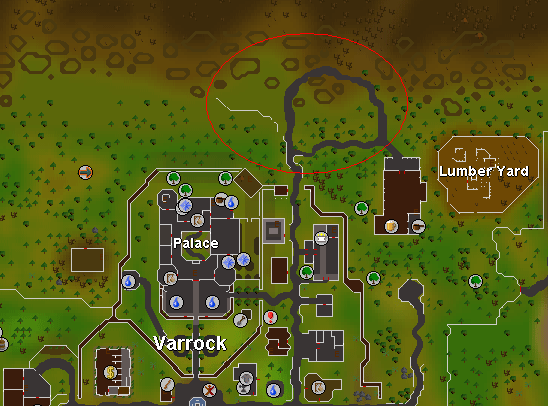 This is a prime spot for new players to RuneScape. You won't find too many high leveled people lurking around here. This place is in multi-combat, and is a famous spot for pure teams to hang out. 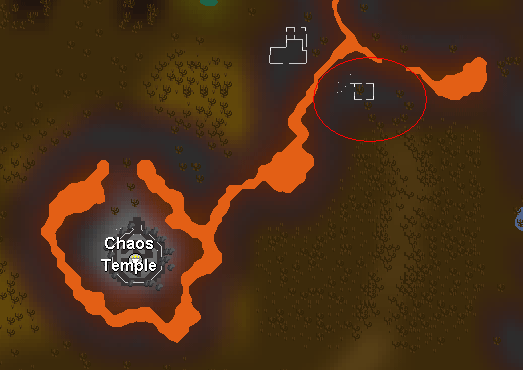 This spot is from around level 1-5 wilderness. This is one of the most dangerous places in Freeplay wilderness. 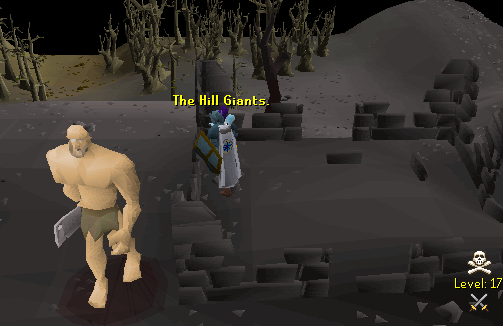 Many high leveled players PK here. It is multi-combat zone, so watch your back. Occasionally there are a few pures here too. Ranges from levels 16-19 wilderness. This area is highly populated by helpless people training, or people coming to collect the treasure which can be found around the area. 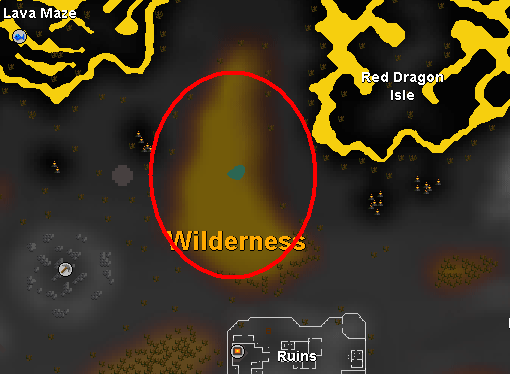 It is good pking spot because it is in high level wilderness, level 38 to be exact, and it is non multi combat zone so you can enjoy the feeling of nobody else taking your kills. 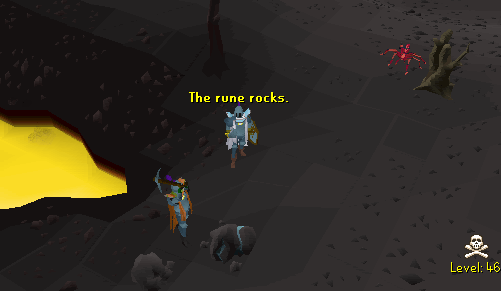 This place is famous in Freeplay because of the only Rune ores available in Freeplay. Usually PKers look for an innocent miner to kill hoping of some free Rune ore. This is also a popular spot for clans. Level 46 Wilderness. Probably the most lethal place in Freeplay Wilderness. Probably the most PKed at location for clans, most of them at extremely high levels. Its multi-combat, as well as in the deep wildy, so its no place to fool around with. Don't bring anything your not prepared to lose. In level 46-47 Wilderness. 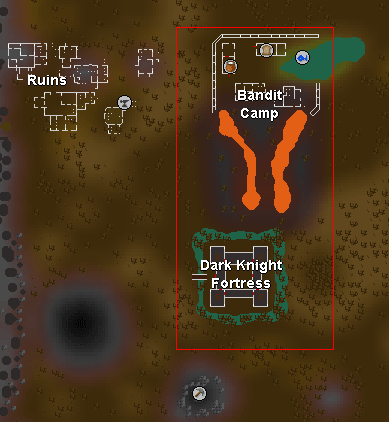 These are places where mostly every PKer comes across in their RuneScape career. 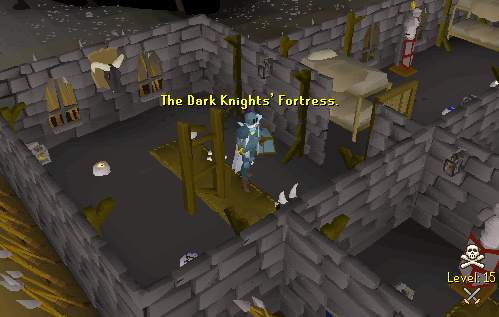 In the Dark Knights Fortress, you'll mostly find low leveled players taking runes from the inside of the Castle. 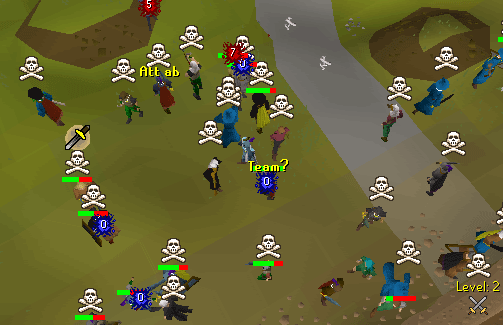 At the entrance is a popular place for people to PK. 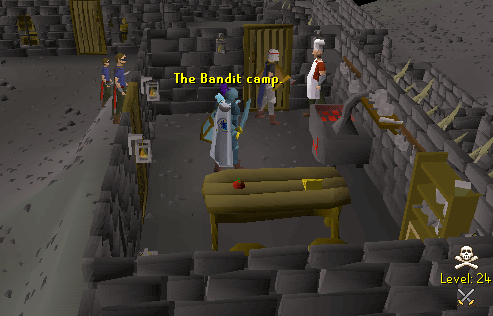 The Bandit Camp isn't usually used as a PKing spot anymore. Sometimes you'll find people making pizza there, and sometimes a random newb. Nothing that spectacular, but sometimes you'll find some interesting prey. Varies from level 20-24 Wilderness. Members Wilderness is extremely dangerous. They have the spells to prevent you from teleporting, the weapons that can tear you up like Credit Card bills in the shredder, and arrows that can pierce your flesh at a whim. The ways to kill your opponent are endless. Make sure you are aware of every moment you are in this treacherous area. 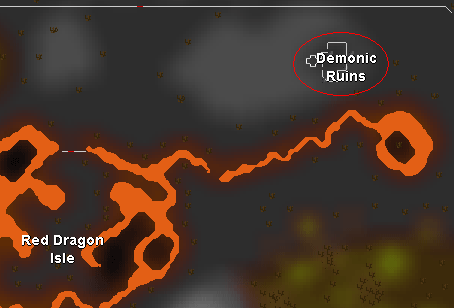 lf people have a Slayer Assignment of Green Dragons, then this is the place they usually tackle it. 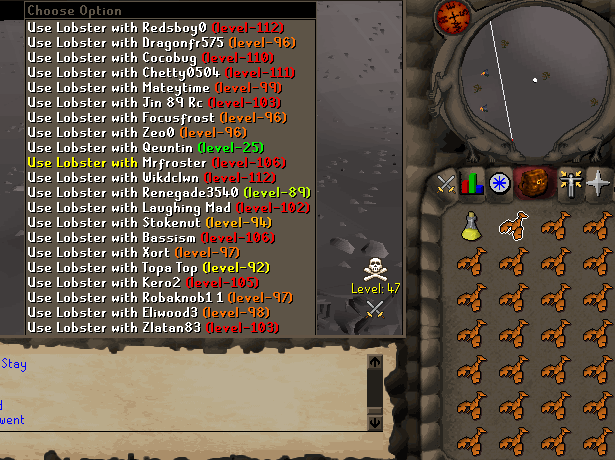 PKers take advantage of the loot they can receive, and its a main spot for PKers of higher levels. Its non-multi combat, so you don't have to worry about people teaming you, other than tag teamers. Level 11-14 Wilderness. 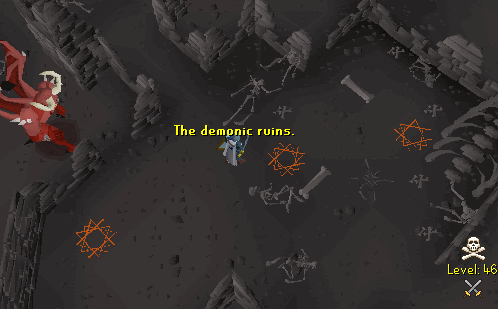 The Abyss is used by RuneCrafters to craft their runes, as it is the fastest way to make them. Yet, it is also the most dangerous because of the PKers that hope to pick up a glory from a RuneCrafter. Usually levels 70+ hang around here. It is non-multi combat, so if your caught in a situation and want to get away, you can run into the aggressive skeletons in the area in hopes to lose your pursuer. 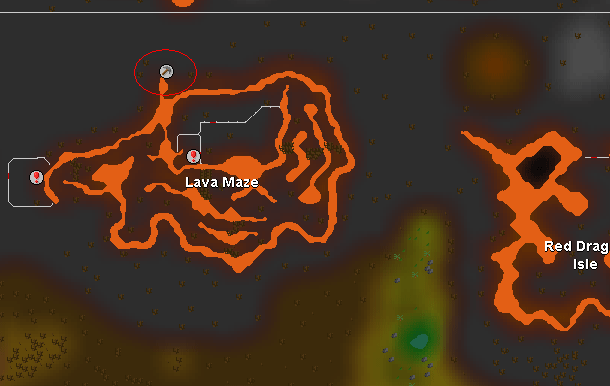 The Abyss is located in levels 3-6 Wilderness. 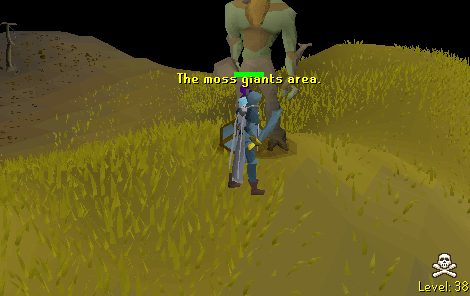 This is the most dangerous place in Members Wilderness. 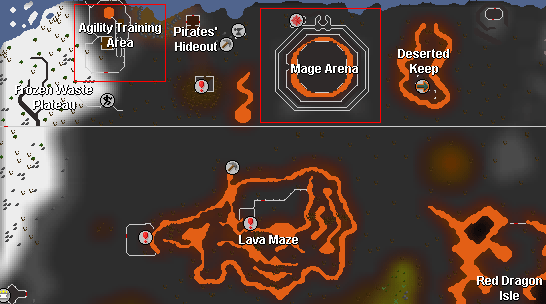 This is where the Mage Training Arena where you can charge your God Staff, and where the Agility Course is to train your agility. People usually use the Ardounge Teleport Lever to where the Deserted Keep is on the map, and then to the shack north of the Mage Arena. If you pull the lever at the Mage Arena, you are teleported into a bank that is outside of the Wilderness. This is an extremely dangerous spot, as level 100+ usually PK there using all their effort to keep you from getting away, usually with success. People also PK at the Agility Arena occasionally, hoping to pick up a few cakes from the trainers there for food. Level 51+ Wilderness. In the Wilderness, its not all about power. If you use good strategy and organization, you can overcome opponents that are stronger than you. If you read further you can learn more about these tips, and how to be feared in the Wild. Explanation: Where everyone in your PKing group stands in a single space. 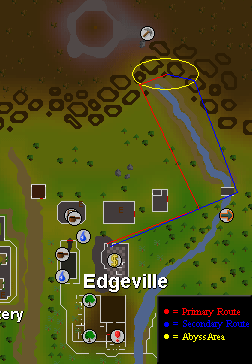 The Death Dot is a lethal trap if you are PKing in a large group or with your clan. It allows you to be compacted into one spot on the mini-map, attracting people that pass by to think it as one player, instead of running away from a large group. The element of surprise is the key here, and that is what makes you to overtake your opponent in a sneaky fashion. Explanation: When the PKers in the group form a box, to maximize organization and to overcome their enemy. The Box Formation is not known among many, but can prove to be important when a clan Runs-in. If the clan leader calls a "5x5 box" for example, each member lines up so that it creates a human box with the dimensions 5 x 5. When a clan charges at someone, it helps the people in the box to pile the enemy. Explanation: Where the members of your group spam the opponent using red text to decrease their visibility of their Life Points. Spamming the opponent can make a tough opponent minced meat. If he can't see his Life Points, then he may not heal himself in time to stay alive. You would be surprised how much it helps, and if you don't believe me, go try for yourself. In the world of RuneScape, there is always a soul out there trying to take your money unfairly. Many of these scams are in the Wild, but no need to worry! This section of the guide will explain to you how to identify and stay away from being scammed. Many people have fallen victim to this trap. Usually the person will ask you to let them get you down to 200 Life Pointswith only your Whip equipped, and they will pay you 400k. Usually what happens is they get you down to 200 Life Points, trade you four Dragon Longswords or Mystic Tops, and then kill you. The problem here is that Dragon Longswords and Mystic Tops protect over Whips. So when they kill you, you will be in Lumbridge without your Whip. Another whip scam is that someone (preferably you) are at Green Dragons with a whip, and then someone comes and drops 3/4 Dragon Longswords. Then the person with the whip picks them up, then the person that dropped the swords kills the person with the whip. And viola, free whip for them. This is an extremely dangerous scam. Usually on the official RuneScape forums, someone will agree to buy/sell an item. Then they will tell you to meet at a place that is near the Wild, such as Oziach's Platebody Shop, Monastery near Edgeville, Jolly Boar Inn, or other places. Usually they will lead you into the Wild (or in some cases you are right on the edge of it anyways) and then kill you. People have lost millions, or even their rares to this scam. So be careful! The Wilderness is an extremely dangerous place. Keep alert, as you may be there one minute, and gone the next. Make sure you prepare well, and most importantly, have fun!